A few years ago, I signed up for a drum class and learned a great secret: playing drums turns out to be a pathway to deep inner presence. Here is how I described it at the time. I am starting to understand a new way of being, a way of sitting more deeply within myself. At times, I am able to meet others in this place, too. There is aliveness and joy in this way of being that is different from anything I have known. For me, it is a precious place. I think of it as a sacred place. Music is one way I find this connection to deep being. My drum teacher, Paul, described it perfectly. The aliveness, he said, comes from dwelling in your center while at the same time surrendering to the complex rhythms of the drum. 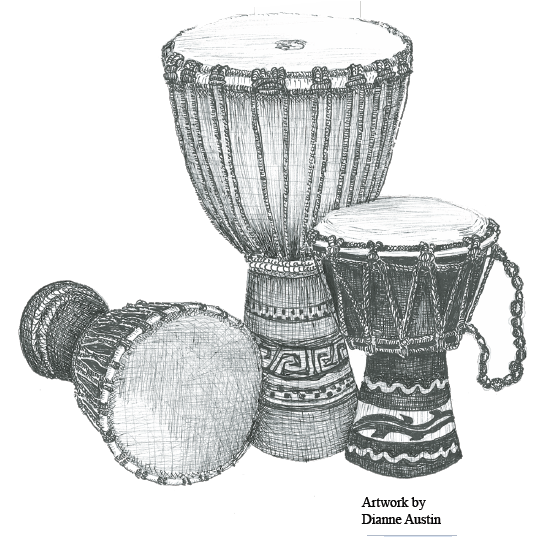 Your arms and hands are creating all this movement, and your body is receiving a whole matrix of vibrations; and if you are drumming in a circle, there is the added dimension of weaving your own rhythms with those of the other drummers. I first noticed how music can take me to this joyous state of inner expansion a few years ago when I started singing with some friends on a weekly basis. Even something as childlike as singing in rounds can evoke it. As with drumming, I love hearing my own part while fully opening up to the rich layers of other voices. The more complex the song, the wider I have to expand to experience the stillness of my own voice within the larger tapestry of harmonies. Sitting inside a place of inner quiet while creating with my voice feels something like playing in a drum circle. It stretches me into a vast and beautiful interior space. When I am able to bring this spacious embrace to situations involving emotional pain, the expansion is deeper still, and healing can take place. I think this must be what any good therapist or priest practices regularly. I get to practice it in the Threshold Choir, sitting at bedsides with a couple of other women, singing to people who are struggling — often at the threshold of death. When we are at a bedside, we sing very, very softly, re-creating the gentleness that we may have experienced as babies being sung to by our mothers if we were lucky. We do not try to “send” healing, but strive rather to embrace what is, moment by moment. Each song we offer contains a universal truth that is sung over and over like a lullaby, getting softer and softer, and slower and slower, so that its message can gradually sink in. We choose songs that fit the belief system and personal circumstances of the person to whom we are singing. If we sense that it is right, we add some softly layered harmonies. Our words, music, and intentions work together to open access to a field of deep peace and safety, a loving place where the dying person and loved ones can be however they need to be. Settling into the emotional space of a bedside, it is possible to fully hold the fear or sorrow of the people in the room, yet sing, at the same time, to their absolute wholeness. There is something heartbreakingly sweet about this. This sweetness is so vast that my heart swells and swells – I have to open wide to contain it. This isn’t at all like having sympathy for someone. There is no judgment here about whether what is happening should be happening. There’s just radical acceptance of what is, there’s a complete container for all that exists in the present moment. The music, offered in this way, opens a doorway for release. When Threshold Choir members are not singing at bedsides, we rehearse songs and open ourselves to that field of healing vibrations by singing to one another. We have a reclining chair, and anyone who is struggling with anything can lie in the chair in the middle of our circle and be sung to. Sometimes I have kept my eyes open and looked at my dear friends while they tenderly sang to the truest part of my being. I don’t know which touches me more deeply, the giving or receiving of this loving gift. We always allow a moment of silence after a song ends. In the quiet, I get shivers down my back. I feel changed. I have had precious experiences in solitude of bringing this fullness of being to my own fear or sorrow. These experiences are imprinted on my soul as episodes of grace, healing moments that brought back to life aspects of my self that I buried long ago. They have occurred during my own meditative practice in which attention to the breath is used to focus awareness in the present moment. When you breathe without pausing, like animals, the breath begins to move old, unintegrated emotional experiences to the surface. Allowing myself to completely re-experience such raw emotions, while simultaneously bringing forth another part of my being that can wholly welcome and embrace my suffering self, is a bit like playing drums or singing at bedsides, but infinitely sweeter. It stretches me into a well of love that is so pure and so deep, I can hardly believe it exists inside me. I do not believe this quality of love is something I can manufacture myself. But I can open to it. Resting in that place of healing, where I can be fully myself in the presence of such sweetness, the old pain can reach a state of completion. It is allowed to be, without judgment… and then it is finished. And where there was once a missing fragment of my being, there is joyous reunion. There is freedom. There is peace. There is overwhelming gratitude. Published for print in 2011. Click here to see publication.